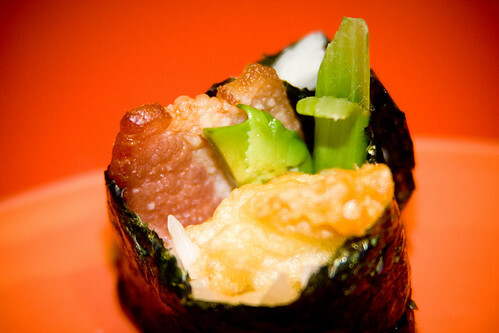 This is very similar to the original Crunchy Shrimp Roll… but with bacon! Because bacon makes everything better. 😛 If you liked the original Crunchy Shrimp Roll and you like bacon, then you are gonna love this one! Bake tempura shrimp as directed on the package. Cut tails off the tempura shrimp. 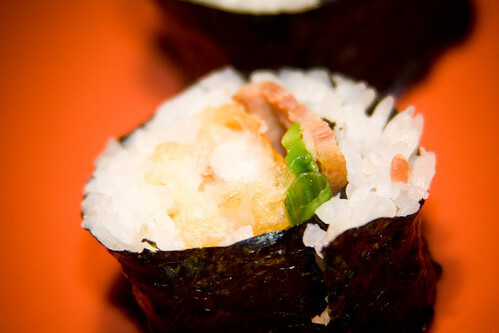 Slice tempura shrimp in half lengthwise, set aside. Cut off the hard skin and discard. Slice the avocado into thin sticks. Wash the green onion, cut the long green stalks off of the white bulb-like things. Discard the white bulbs. Fry (or microwave) the bacon until it is of desired crispyness. 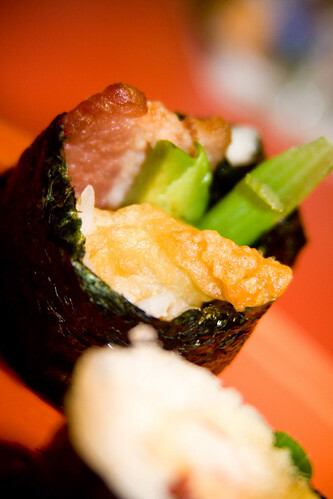 Roll the sushi, using 2 pieces of tempura shrimp, avocado, a green onion stalk, and a slice of bacon as your fillings. Mmmm. This one I will try out! I love how you take your pictures. I always get hungry reading your posts! Augh, that thick piece of bacon looks so yumm! Um, is your brother ok? 🙁 It’s okay if you don’t want to talk about it, but just let us know if he’s okay ! P.S. To everyone else… I’m not telling you this because I’m asking for a pity party, but rather I feel that it’s only fair to let you know why I might disappear every now and then. Sorry to hear about your brother’s medical woes. I think we’ve got a bit of sense of community here after being brought together by our love of sushi so I don’t feel the mention is inappropriate. Thanks so much Lara. 🙂 I’m so glad that sushi can bring people together in a community! Allison, my uncle also had leukemia…I know how it is. I know it’s your brother, so that’s different, but I know. If you guys don’t find a family doner, I would be more than happy to ask my doctor to test my bone marrow for a match – I know it’s extremely painful, but it’s better than the possible alternative. I also have some friends who have offered the same thing – you have us at your disposal. DON’T feel bad to ask – we’re talking about your family here. We know you would do the same for us. Wow, looks very good – must give this one a try sometime soon. Have fun exploring and trying sushi recipes! Let me know if you come up with any new or crazy sushi that I could put on SushiDay! You have never made this for me. I object to this madness. Take pity on my poor soul! But then again, you do spoil me! We have tried a couple of you receipes…very nice! I will stay away from the bacon in general and simply take the skin of the salmon, and fry it in a pan, then replace the bacon by the fried skin…yumee!!! Kristen – I have too made it for you! At least twice. Manu – Thanks. Salmon skin sounds like it might be interesting too! Looks amazing i need to eat sushi now before i die.